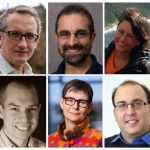 UCLIC is hosting a symposium that brings together leading HCI researchers to identify and discuss the grand challenges for HCI research in the next decade. The event is now fully subscribed, but we warmly invite you to join us for what promises to be a very stimulating day via our YouTube live stream. We will be taking questions from those of you participating through the live stream. We will update the YouTube page with details on how to submit your questions shortly.